For more details on each item, follow the links. North Beacon Hill Council meeting, 7:00 pm at the Beacon Hill Library (2821 Beacon Avenue South), with folks from the Findlay Street Church in attendance to talk about the development at 14th and Bayview, proposed City of Seattle development guidelines with the Department of Planning and Development, Parks Opportunity Fund info, 12th Avenue/City Light meeting details, Beacon Arts Council and Merchants Association info, and more. City Year Breakfast Of Champions, 7:30 to 9am. Meet current members and staff, learn how to join, and have breakfast! Green Eggs and Ham, a movie, and crafts for kids at 6pm at the Jefferson Community Center, 3801 Beacon Ave S.
Blaine Memorial sukiyaki dinner, 4 to 7pm (or 2 to 7pm for take-out), at 3001 24th Ave S.
Container veggie gardening classes from Seattle Tilth from 1-2pm at Jefferson Community Center, 3801 Beacon Ave S. Classes are $60, require advance registration, and run each Saturday from 3/6 through 3/27. Technology Matching Fund grant applications due by 5pm. Last chance this spring to apply for matching grants of volunteer labor, materials, professional services, or cash through the TMF program. The Mayor’s Youth and Family Initiative community meeting, 7:00 pm at Van Asselt, 8311 Beacon Ave S, with former mayor Norm Rice, Estela Ortega of El Centro, and deputy mayor Bob Watt. Parks board meeting, 7:00 pm at the Jefferson Community Center, 3801 Beacon Ave S, focusing on the Parks and Green Spaces Levy and a Planning and Development Division update. Solid Ground Bowl-a-thon at West Seattle Bowl, 4505 39th Ave SW, benefiting Beacon Avenue and El Centro de la Raza food banks. 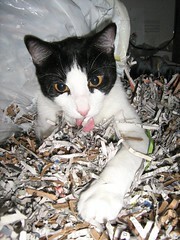 Please, only bring paper documents to be shredded! No animal shredding will be allowed. Photo by oddharmonic.